Container Garden Designs, and Recipes So You Can Easily Recreate Them! 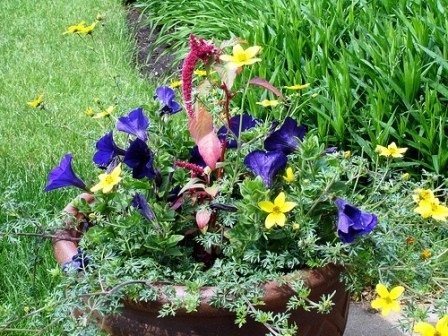 Get inspired by container garden designs that are super-easy to recreate at home. Just click an image and follow the instructions to make the design for yourself. Have a design you'd like to share? Click here to send us a photo! 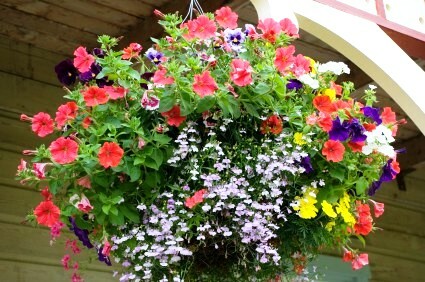 Container gardening offers you the chance to grow plants anywhere, in a yard or on a balcony or porch. You can take your containers indoors and create your own garden oasis in any room. And with container gardening, you can garden in an apartment or city. you don't have to dig or till a garden spot. It's also easier on the back and knees, and you can easily change the look of your container garden by moving a few containers or pots. And if you really want to create a unique garden, mix your pots. You can go terracotta, or use an old beat-up teapot. My saying is, "If it will hold dirt, then it can be a container!" As you can see from this Barbie Dream Car convertible toy, repurposed as a home for ferns, the 'green' movement gives a whole new meaning to recycling! ...including paint cans, tires, a shopping trolley, old tree stump and much, much more! Now it's time to consider which plants you will grow alone, add to your flower garden, etc. Vegetables, trees, shrubs, flowers and fruit all grow well on containers. And mixing all the varieties will add to your garden oasis look. 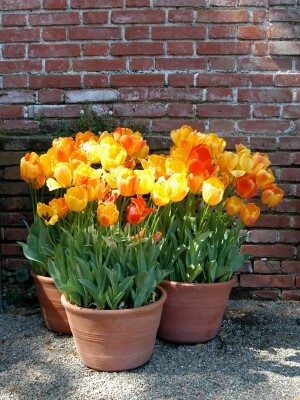 Plants of choice – chose your plants beforehand to help you pick the pots you will need. 1. Are you growing vegetables, herbs, flowers, or a mix in your Garden Designs? I suggest mixing them. You get a colorful look and companion planting helps most plants to grow and thrive better. Your choices will be based on your needs. 2. Make sure your containers are clean and dirt-free. I usually wash my pots with a light bleach or vinegar and them let them air until they are dry. Also check for good drainage and make sure, particularly if your containers are indoors, that you have them sitting on a plate, saucer or reservoir to catch any water. For all indoor containers I use pebbles in reservoir trays to help the plant drain and to add humidity around the plants. Sometimes a plastic container inside the pot is a good idea. And finally when choosing a container, remember that the larger the plant when it's mature, the bigger the container should be. 3. Your plants will only be as good as your soil, so buy high quality soil or use compost. Indoors, I tend to use more soilless potting mixes. It cuts down on indoor plant diseases. And make sure to have organic fertilizer on hand for you plants, particularly vegetables. They will require an extra boost to produce a good crop. 4. Layer half to three-quarters of an inch of pea gravel in the bottom of your containers to help drainage and root health. Small clean pebbles can also be used. Next, place the soil in the container, pack it down and slowly add some water, making sure you don’t add too much water or it will overflow and your soil will follow. 5. I let the pot sit for a bit and settle and drain. After the pot sits and drains, its time to add your plants or seeds. When the plant or seeds have started to grow and get used to their pot, I will add some organic fertilizer. Read the directions to make sure you apply the proper amount. Your container garden plants are ready to be enjoyed in any and all garden designs! Most flowers and vegetable like sun and would benefit form 5 to 7 hours of sun. 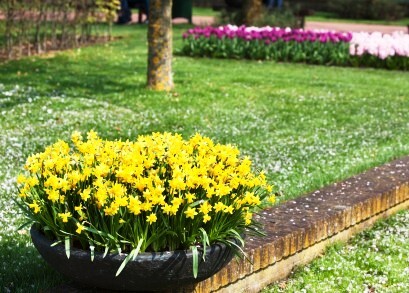 Place these plants in an area where they will receive the most sunlight during the day. Time will help you decide what amount of sun a plant needs. You can also pick up a good gardening book or search the web for additional information! Remember, the advantage of containers is that they can be moved. And when you group them together it makes a very pleasing display. Container gardening lends itself to city and apartment gardeners. And although I don’t live in a city I enjoy my container gardens and potted plants for their ease in growing and their artistic value they add to my home. 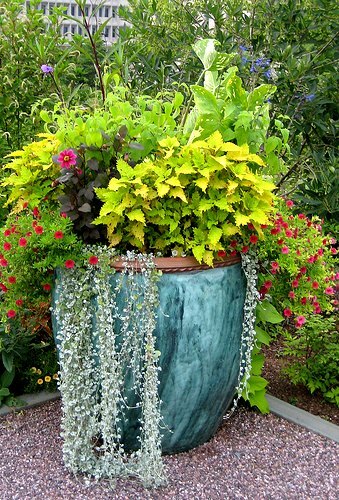 Don't miss this amazing page, packed with great-looking container garden designs and ideas. 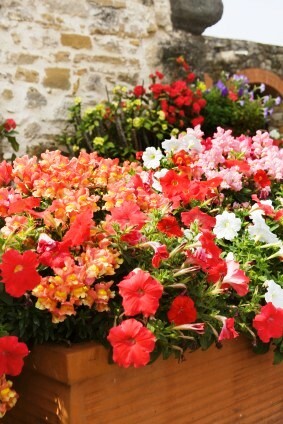 Want to choose some lovely annual flowers for a container garden? Then check out this great page, with links to dozens of choices. Plant once, reap the rewards for years! Choosing perennials for container gardens is made much simpler with our article. Grow your own food with our detailed, in-depth guides to growing potatoes, Brussel sprouts, salad and much more. More great ways to improve the look of your rooftop, yard, patio or home with fun design ideas. Share Your Container Garden Design Pics! Have a beautiful Container Garden Design and a tip or two on how you grew it? Share it with us, we would love to see and read about it! Describe Your Container Garden Design. For example, "My Big, Amazing Petunias!" 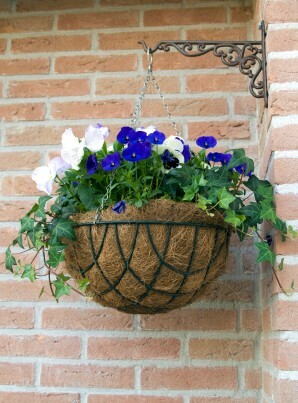 Click on the links below to see some great designs, stories and tips about container gardens. They were all taken and written by other visitors to this page. Discover more Container Garden Designs and ideas! Article above was written by Denise from thegardenersrake.com and used under the Creative Commons Lic.